With Halloween just around the corner, you’re probably already basking in the excitement that comes with decorating your front yard in preparation for what could arguably be considered one of the most highly anticipated nights of the year! 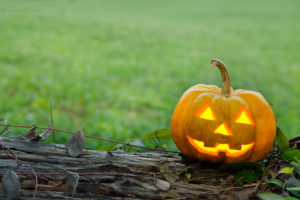 While (most) adults don’t really go trick-or-treating unless they have at least one child present, you can still partake in some of the seasonal festivities such as adorning your front lawn with some truly awesome and creative Halloween decorations! Here are a few simple, yet fun DIY Halloween garden decoration ideas you can try making at home with your kids! Jack-o-lanterns are a timeless Halloween staple for pretty much any household. Not only is it fun to spend quality time carving pumpkins with your kids, but it’s also a great nostalgia-inducing Halloween activity that’ll most likely bring back fond memories of your own childhood. The best part is that with the countless stencils available nowadays, you and your kids can get creative and carve out your favourite characters or images. For some people, nothing is spookier than getting caught in a sticky spider web in the darkened hallows of someone’s doorway! Strategically placing cobwebs and spider webs near your front door, on your fence posts, or throughout the trees on your front lawn is a great way to get people into the spirit of Halloween! Speaking of spirits, another awesome Halloween decoration can easily be made by blowing up a few balloons, drawing creepy faces on them with black marker, covering them with a white transparent cloth, and then hanging them from the trees in your front yard. This will make it look like you have ghosts hanging around your front yard and the wind blowing in the background creates an eerie rustling affect that works perfectly with your entire theme. Remember that scene from Snow White And The Seven Dwarfs when Snow White is running through the forest and she sees the eyes of the woodland creatures staring at her through the bushes? You, too, can create that same creepy affect in your very own front yard. If you have large bushes, all you have to do is buy a few large googly eyes and then place a small backlight behind the bushes to make them more visible in the dark. Fake lawn tombstones are another traditional Halloween decoration must-have this season! Pair them with dry ice for a foggy effect and fallen brown, red, and yellow crunchy leaves and you have the perfect components to create a pseudo cemetery on your very own front lawn! Looking for useful garden maintenance tips this fall? FOREVER GREEN LAWN & LANDSCAPE INC. is your go-to lawn and garden care expert in Toronto and the GTA. With well over 20 years of experience in the landscaping industry, we’re confident that we can help make your front and backyard ready for the upcoming colder temperatures! Schedule a complimentary consultation with one of our landscape management specialists today! © Copyright 2019: FOREVER GREEN LAWN & LANDSCAPE INC.